"This recipe is a hit wherever you go. It is a very rich and cheesy meal and looks like a deep-dish pizza when done. I altered what I was originally given because I did not like cottage cheese and added other ingredients that I thought it deserved." In a large bowl, mix eggs, ricotta, half the mozzarella, half the Parmesan, parsley, salt and pepper until well combined. Stuff cooked shells with ricotta mixture and place in a 9x13 inch baking dish. In a medium bowl, stir together pasta sauce, mushrooms and reserved mozzarella and Parmesan. Pour over stuffed shells. Bake in preheated oven 45 to 60 minutes, until edges are bubbly and shells are slightly set. 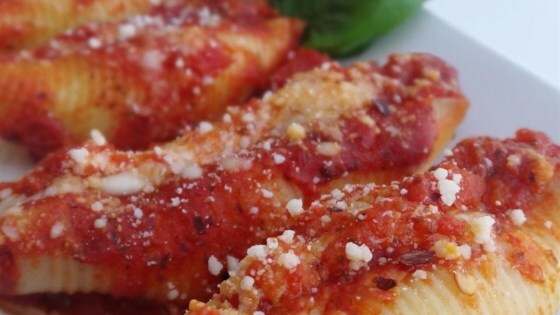 Baked pasta shells with spaghetti sauce and Parmesan cheese.